Every .NET developer needs a .NET assembly browser. We do not need such tool for everyday usage. But we need to take a look at an unprotected compiled .NET assembly sometimes. One free tool well-known in the field is not a freeware anymore and .NET coders need an alternative. Rustemsoft represents free Refractor .NET assembly browser and decompiler that should be good for your .NET development needs. Also Rustemsoft Skater .NET obfuscator is equipped with .NET assembly browser and decompiler interface since ver5.0. Free and Demo versions of Skater .NET obfuscator include the fully functional .NET code browser interface. Rustemsoft LLC does not charge for the .NET assembly browser and decompiler. 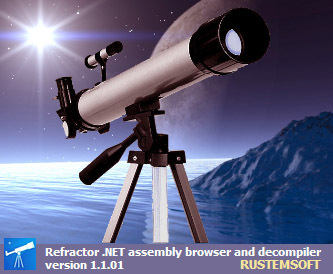 To run free Refractor .NET assembly browser and decompiler .NET framework 4.x has to be installed. Refractor .NET assembly browser is free developer productivity tool designed to enable easy .NET assembly browsing and decompiling. The interface builds on years of experience in code analysis and development productiveness specially created for Skater .NET obfuscator, Rustemsoft's .NET code protection software. The .NET assembly browser and decompiler lets you explore and analyze without exertion compiled .NET assemblies, decompiling code with the simple click of a button. .NET assembly browser and decompiler interface is a great tool for doing an in-depth examination of various types of assemblies and also for disassembling IL code towards a supported .NET languages Â– C# and/or VB. The free decompiler can be used to inspect, navigate, search, analyze, and browse the contents of a .NET component such as an assembly and translates the binary information to a human-readable form. By default .NET assembly browser and disassembler allows decompilation of .NET assemblies into C#, Visual Basic .NET, and Common Intermediate Language (IL). It can be used to effectively convert source code between C# and VB. It can also be used to find assembly dependencies, and even windows DLL dependencies.